San Francisco Bus Tours - Official© Hop On Hop Off bus tour. See San Francisco at night by adding the Night Tour option when you book the 2 Day Ticket. 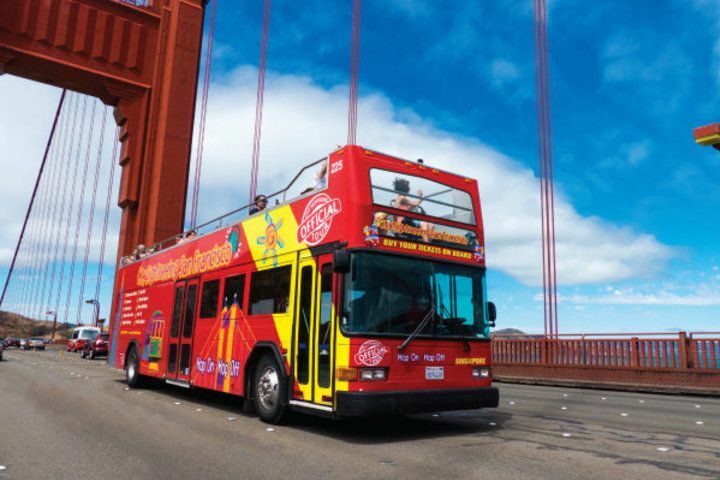 Our most popular San Francisco tour includes 3 open-top sightseeing bus tours in 1 package. Hop-On and Hop-Off unlimited times during your stay for up to 48 hours. Includes Official City Tour, Sausalito Tour, and the Night Tour. Hop off the bus at Fisherman's wharf for your Madame Tussauds experience with your favorite stars. See the world famous crooked street with its 7 hairpin corners. 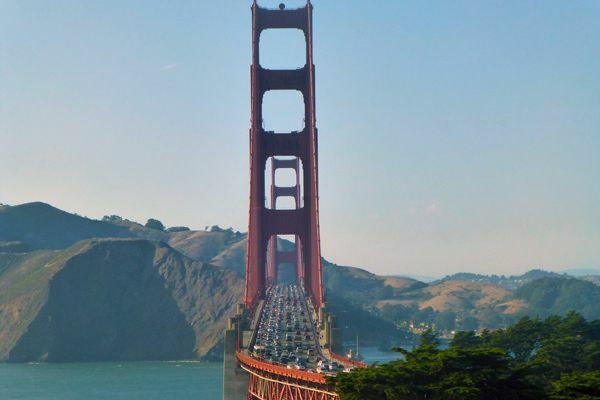 Hop off the bus and walk across the Golden Gate Bridge, its an unforgettable experience. For a limited time, your 2 Day ticket includes the exciting 7D Experience. Add the Night Tour to see this amazing city lit up in all its glory. Rise above the crowded streets and see the city from the top deck. A remnant from the 1915 Pan Pacific Expo, this is a favorite spot for tourists and locals to hang out on a sunny day. 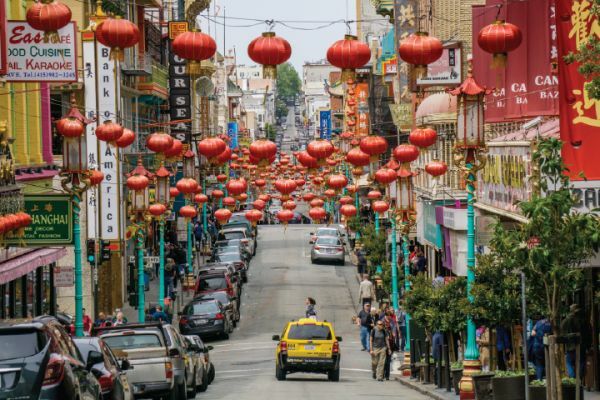 Walk down the red lantern lined Grant Street in Chinatown and pick up a bargain or two along the way. One of the many highlights of Golden Gate Park which also includes the California Academy of Sciences and de Young Museum. Dip your toe in the Pacific Ocean then grab lunch at the Cliff House when you take the Parks and Beach tour from Golden Gate Park. Located across the Golden Gate Bridge in Marin County, Sausalito is a stunning coastal town to spend an afternoon. With this package you will view all must-see sights of San Francisco! 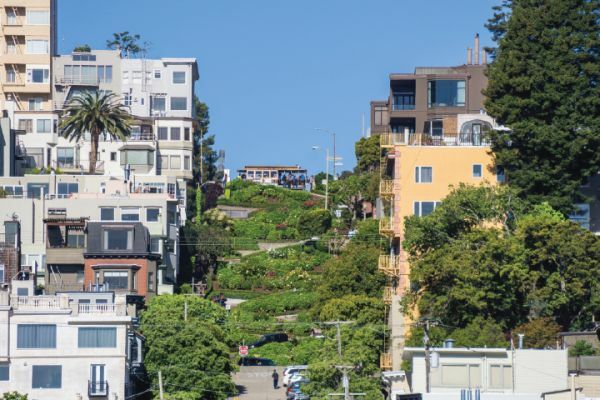 You will explore Fisherman’s Wharf, Pier 39, The Golden Gate Bridge and Golden Gate Park, Lombard Street, Chinatown, Union Square, Haight/Ashbury and much more! Be sure to bring your camera as there will be plenty of photo opportunities from the top deck of the big bus to remember your visit to the city by the bay. Unlimited use for 48 hours on 3 Tours: The Official City Tour, The Sausalito Tour, The Night Tour. Hop Off at any of the stops to discover the city at your own pace. Fisherman's Wharf and Pier 39 - World famous waterfront with shops, restaurants, fishing boats, attractions, sea lions and bay views. Embarcadero - The eastern waterfront with restaurants, shops, and the Ferry Building. 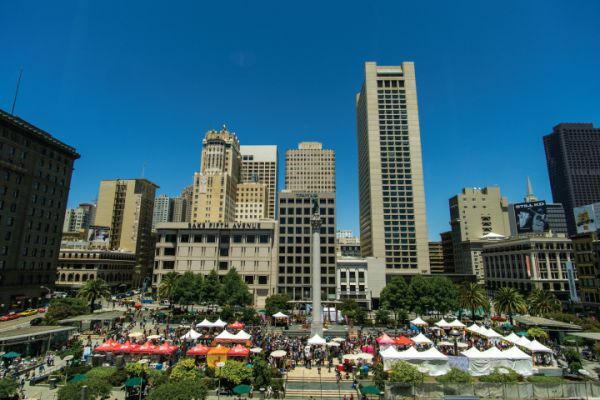 Union Square - Home to of San Francisco's nicest shopping and popular nightlife. Lombard Street - The most crookedest street in the world. 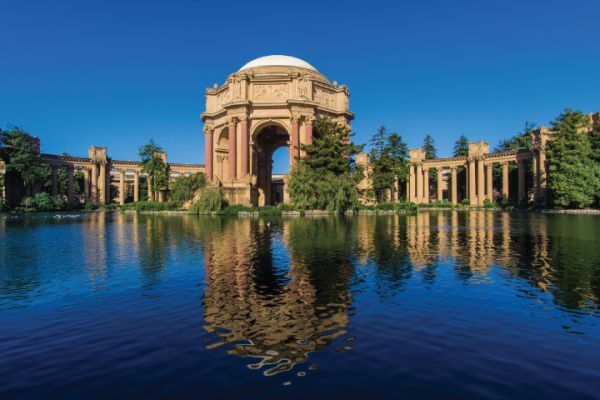 Palace of Fine Arts - Popular location for many festival celebrations, orchestras and events. Golden Gate Bridge - Cross the iconic symbol of San Francisco. The Presidio - A national park and recreational paradise featuring spectacular vistas, meandering trails, and historic and architectural treasures. 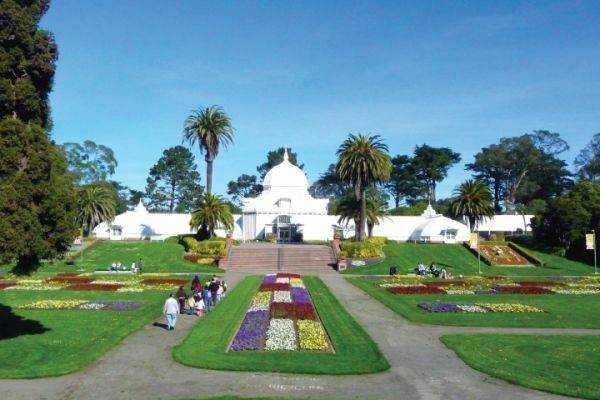 Golden Gate Park - Hop Off here to visit Academy of Sciences, de Young Museum, Conservatory of Flowers and much more. Haight-Ashbury - The birthplace of hippie culture and Summer of Love. Alamo Square - See beautiful Victorians houses, better known as the San Francisco Painted Ladies that surrounded this area. City Hall / Civic Center - Great photo opportunities of the San Francisco City Hall structures nearby to the Opera House, Symphony Hall and Bill Graham Civic Auditorium. Financial District - Get a spirit of the Financial District and see the tallest buildings of San Francisco. Chinatown - The largest outside Asia and a great area to spend a few hours walking around. North Beach - Primarily Italian neighborhood, with dozens of authentic Italian restaurants and cafes. 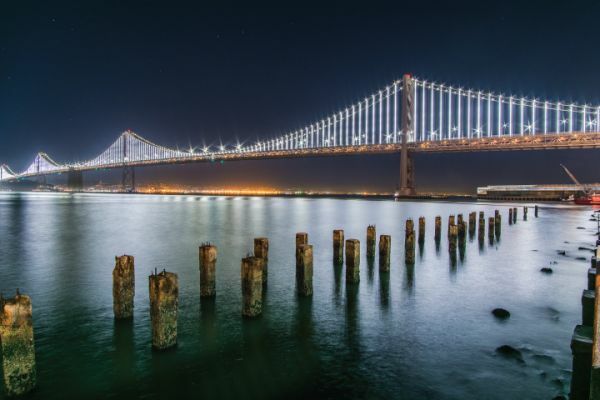 Bay Bridge - Don’t miss it during the Night Tour! Sausalito - Charming and picturesque town on other side of Golden Gate Bridge. Hop -Off here to enjoy its galleries, souvenir shopping, bay views and its many restaurants. San Francisco Night Tour - Departs daily, 6:30pm and 7pm.